A narrow ribbon-shaped country stretching along the west coast of South America, Chile contains a dazzling range of cultures and landscapes. There’s just so much to see and do as you wind your way down through it. 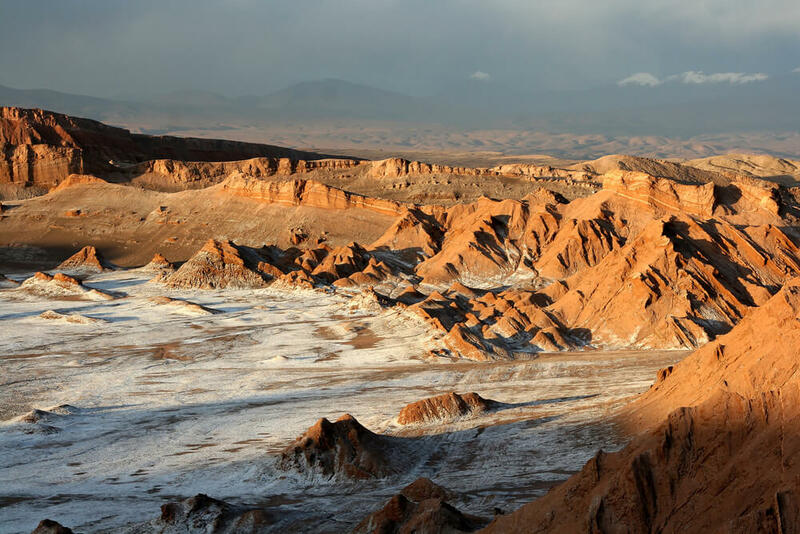 Reaching from the dry moon-like landscape of the Atacama desert to the very bottom tip of South America, Chile encompasses sand dunes, lush valleys, ancient forests, volcanoes, glaciers and sunny beaches. Squeezed in by the Andes and the Pacific Ocean on either side, you can travel down a string of destinations each completely different from the next. All the while, you’ll enjoy the rich flavours of the local wine, the friendly and open nature of Chileans and the strong history of this country’s traditions. So, if you are planning out a trip around Chile which destinations should be on the top of your list? Here are a few of the best places to visit within this exciting and naturally gorgeous country. At some point between 1,500 BC and 400 AD, the Atacamenos people settled at an oasis in the Atacama desert and started weaving baskets and making ceramic pottery. These days, the small town in the desert is a retreat for adventurers who are seeking to explore the surrounding arid landscapes. 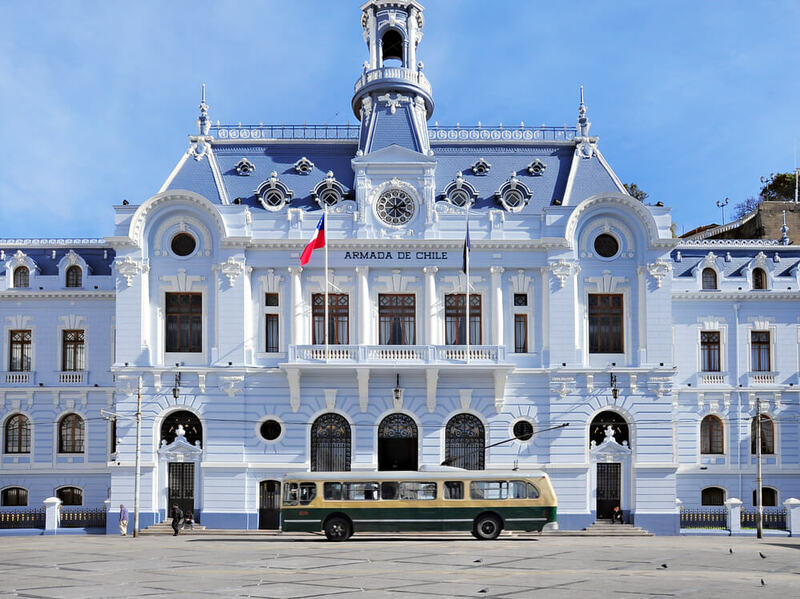 The small town, with quiet adobe streets, an elegant church and a tree-lined square, is a great base for exploring some of the most spectacular scenery in Northern Chile. From here, you can take a drive to the largest salt flat in the country, see geysers shoot steaming water out of the earth’s surface and visit strange moon-like rock formations. Bedecked with bright, irreverent street art – this crumbling seaport has a poetic and bohemian vibe. It’s only a short drive from Santiago, yet it has a totally different feeling than the capital. Rainbow hued houses are perched on steep hills overlooking the blue ocean stretching to the horizon. Take a walk through the winding streets and you will find vintage funiculars to lift you up the steep hills, quirky coffee shops, friendly and welcoming bars and a wide range of restaurants. You can even enjoy the seaside views from the uniquely designed home of Pablo Neruda, a poet and diplomat and an important figure in Chilean history. The nightlife in “Valpo” is laid back and lively and goes on until very late at night (or… early in the morning). This raging river is known among white water rafting professionals as one of the best spots in the world for rafting. With swiftly flowing deep greenish blue waters and imposing craggy cliffs on either side, it is one of the most scenic rivers in South America. If you crave an adrenaline rush, rafting down this river with one of the experienced local tour companies is a must while you are in Chile. While you are in the town you can also experience many other great activities, such as fly fishing, mountain biking, hiking and much more. 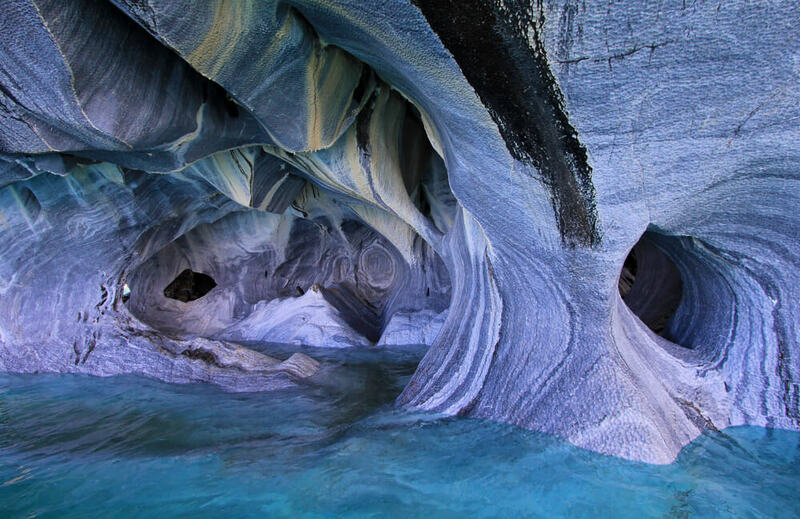 The Marble Caves at Puerto Rio Tranquilo are so strange and beautiful that it is hard to believe they are real. They are located in the southern part of the Carretera Austral, inside the second largest lake in South America. This is just another one of the places in Chile where nature goes above and beyond to astound the visitor. The caves are made of marble and are rippled through with swirls of pale blue, green and white. Although the caves are the main attraction, there are also many other things you can do while staying in the quiet and peaceful town of Puerto Rio Tranquillo. You could rent kayaks and go for a paddle, or take a day trip to the stunning Glaciar San Rafael. The name of this national park means “Towers of Blue” and that is a poetic way to describe the imposing craggy rock pillars that loom over the icy landscape. It’s no wonder that this park was given the honor of 5th “Most Beautiful Place in the World” by National Geographic. There are many ways to explore this beautiful park – including multi-day treks or mini-van tours. There is even the option to do a horseback riding tour to some of the local sites. 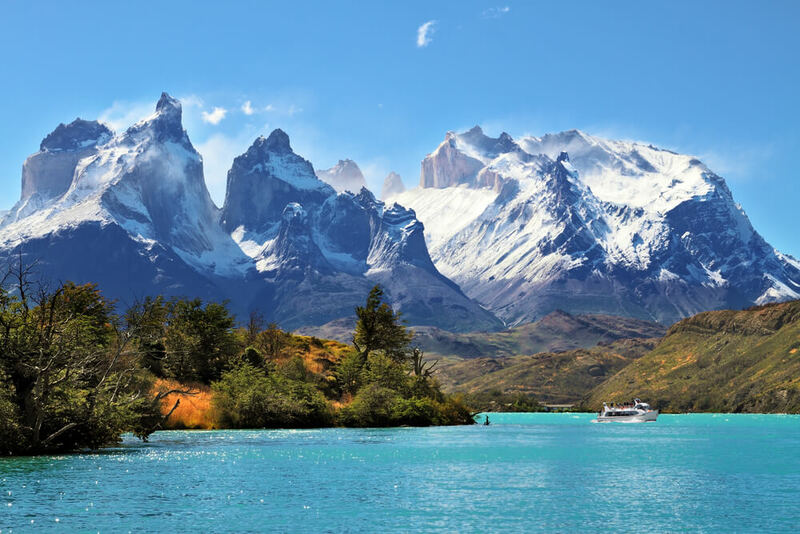 Torres Del Paine offers some of the most spectacular scenery in all of Patagonia, including waterfalls, mountain lakes, glaciers and much more. It’s hard to believe that such a diverse range of landscapes can fit into this relatively tiny area. The best time to visit is between September and April – the spring and summer months. Outside of this time, the weather becomes too extreme. A great way to see the best sites of the area is to take on the five day “W” route. Or, if you are up to the challenge you can tackle the 8 or 9 day full circle route. If you aren’t in the mood for camping out, there are also several comfortable and stylish hotels throughout the park. Do you love penguins? If so, this very special destination in Chile should be on your bucket list. It is a small island located 35km northeast of Punta Arenas where the largest penguin colonies of South Chile can be found. This includes over 60,000 breeding pairs of Magellanic Penguin. Also, many other creatures can be spotted here including the dolphin gull, sea lions and fur seals. The penguins migrate back here to find their mate during September or October of each year, then return to the sea by the end of March. The area was designated a natural monument in 1966 to preserve the breeding area for the penguins, as well as the habitat of many other migratory birds. During your visit, stop in at the small museum on the island where you can learn more about the creatures of this ecosystem. Known for its strange and iconic Moai Sculptures, Easter Island is the most remote island in the world – located farther from land than any other island. This isolated enigma has drawn curious travelers from all over the world. It’s so out-in-the-middle-of-nowhere that it doesn’t even feel like Chile – let alone anywhere else in the world. There’s a lot more to Easter Island than those famous sculptures of heads in the sand (guess what, there are actually bodies attached to those heads!). As well as visiting the fascinating monoliths you will also be able to enjoy surfing, snorkeling, diving and much more. Plus, there are quite a few stunning white sand beaches perfect for lounging on or riding down on horseback. It’s not easy to get to, but visiting Easter Island is an experience you will never forget. The Lake District of Chile is often referred to as the “Switzerland of South America” due to the stunning blue lakes surrounded by sky-piercing snow-capped peaks. However, these mountains are a little different than the Swiss Alps – they are volcanoes. This rugged region is a popular hotspot for active travelers and hikers and you can enjoy many exciting activities here including watersports, skiing, rafting and mountain biking. Twelve sparkling lakes are spread throughout the area and there are countless walking trails to explore. Pucon is a popular tourist town in the Lake District, located next to a peaceful lake with a view of a volcano. In a remote corner of the La Araucania Region you’ll find this tranquil saltwater lagoon, which was formed after the devastating Valdivia earthquake and tsunami in 1960. The shores of this wild and beautiful lake are home to the largest surviving indigenous group in Chile – the Mapuche. During your visit you can live alongside the locals and get to know what their lives are like by sleeping in traditional ruka homes, working with the local craftspeople and eating Mapuche cuisine. It will be a unique travel experience that will give you a deep appreciation for a different culture. These are just a few of the most beautiful places you can explore in Chile. What is your favourite Chilean destination? And remember, you can stay online in Chile with our 1GB zone A data plan and save up to 85% on data roaming costs.